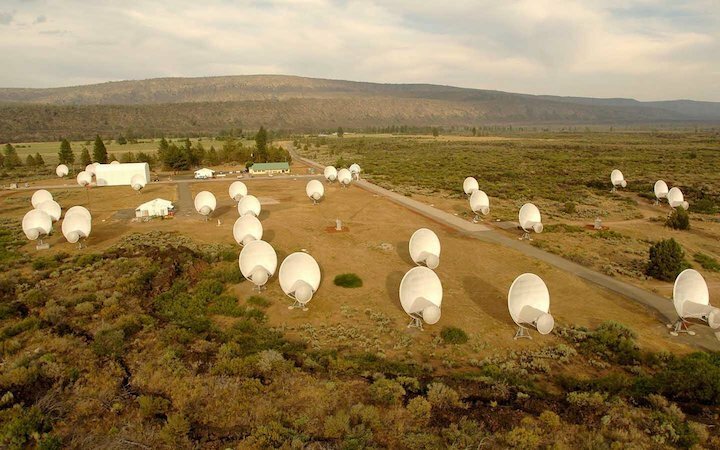 A view of the Allen Telescope Array in California. With research on extraterrestrial life continuing across the world, a noted researcher from the Search for Extraterrestrial Intelligence (SETI) Institute launched a new tool to help researchers keep track of results. Jill Tarter, a co-founder of the institute who inspired the fictional character Ellie Arroway in the Carl Sagan novel "Contact" (which later became a 1997 movie), led the development of a newly announced web tool called Technosearch. This database includes all published SETI searches between 1960 and the present day. You can view the database online at https://technosearch.seti.org/. "I started keeping this search archive when I was a graduate student," Tarter said in the statement. "Some of the original papers were presented at conferences or appear in obscure journals that are difficult for newcomers to the SETI field to access. I'm delighted that we now have a tool that can be used by the entire community and a methodology for keeping it current." Technosearch was developed in collaboration with Research Experience for Undergraduates (REU) interns, who were working under Jason Wright — an exoplanet and star researcher at Penn State University. One of those former REU students, Andrew Garcia, said the new tool will play a big role in SETI. "I've become convinced that Technosearch will become an important instrument for astronomers and amateurs interested in exploring the cosmos for indications of other technological civilizations," Garcia said in the statement. "We can't know where to look for evidence tomorrow if we don't know where we have already looked." Technosearch was released yesterday (Jan. 9) at the 223rd meeting of the American Astronomical Society during a poster session. Such a search could well draw upon scientific instruments that were designed for other purposes. “There are so many instruments we’re going to build, and if you only opened your mind and thought about different ways we can use them, there’s a lot you could do,” Tarter said. “The sense I get is that there’s been an attitude change,” he said. “Going from geek culture to pop culture made it OK to talk about it without the cool kids sneering,” he said. Three years ago, Wright threw a spotlight on the issue when he suggested that a distant star’s anomalous pattern of brightening and dimming just might point to the presence of an alien megastructure — an energy-generating “Dyson sphere” built around the star by a super-advanced civilization. Last year, legislation was introduced in Congress to set aside $10 million in NASA’s annual budget to support the search for technosignatures. NASA picked up on that cue, and organized a conference in September that surveyed the field. The space agency’s associate administrator for science, Thomas Zurbuchen, tweeted his support for the concept, and Wright helped edit the resulting report. During this week’s AAS meeting, about 10 researchers gathered in a conference room at the Washington State Convention Center to work out strategies for addressing technosignatures in the Decadal Survey. “For me, the bottom line is that the search for technosignatures is a scientific priority for NASA and the National Science Foundation,” Wright said. “Even the process of thinking or doing technosignatures has a very high reward in serendipitous discovery of natural phenomena,” she said. Shelley Wright is particularly interested in how multi-messenger astronomy could take advantage of gravitational-wave detectors and neutrino detectors to boost the telescope-based search for technosignatures. Jason Wright, meanwhile, wonders whether space-based observatories like the European Space Agency’s star-mapping Gaia satellite could pick up on the heat signature of extraterrestrial civilizations. Spacecraft that look for planets beyond our solar system, such as NASA’s Transiting Exoplanet Survey Satellite (a.k.a. TESS), could be programmed to flag anomalies for follow-up study, and artificial intelligence could be enlisted to sift through terabytes’ worth of radio and optical readings. In the years ahead, keeping track of all the ways to check for technosignatures may turn out to be one of the key challenges. Tarter and an undergraduate researcher from San Francisco State University, Andrew Garcia, have built a software tool called Technosearch that organizes decades’ worth of SETI studies into a searchable database. The research doesn’t have to be right, but it has to be published, Garcia said. One of his favorite examples is a paper written in the 1960s by Russian astrophysicist Nikolai Kardashev that misidentified synchrotron emissions as signals from an alien civilization. Perhaps the best thing about the SETI Institute’s Technosearch tool is that the code can be updated to add any kind of technosignature that scientists start looking for in the decades ahead, whether it’s gravitational waves, neutrinos or alien megastructures. “All we have to do is slap in a new list,” Garcia said.